What is the Bedford Rotary Foundation? The Bedford Rotary Foundation, Inc., is a 501(c)(3), non-profit, public charity established and organized by the Rotary Club of Bedford and dedicated to both local and international service. The Foundation is the funding arm of the Club. It is independently managed by the Trustees of the Foundation who strive to amplify the Rotary Club of Bedford's service to others by funding projects consistent with the Club's mission. The funds managed by the Foundation Trustees are the accumulation of monies donated or raised to support the Club's service and project efforts. Donations from individual supporters and corporate sponsors, for both general and project specific support, are directed to the Foundation. 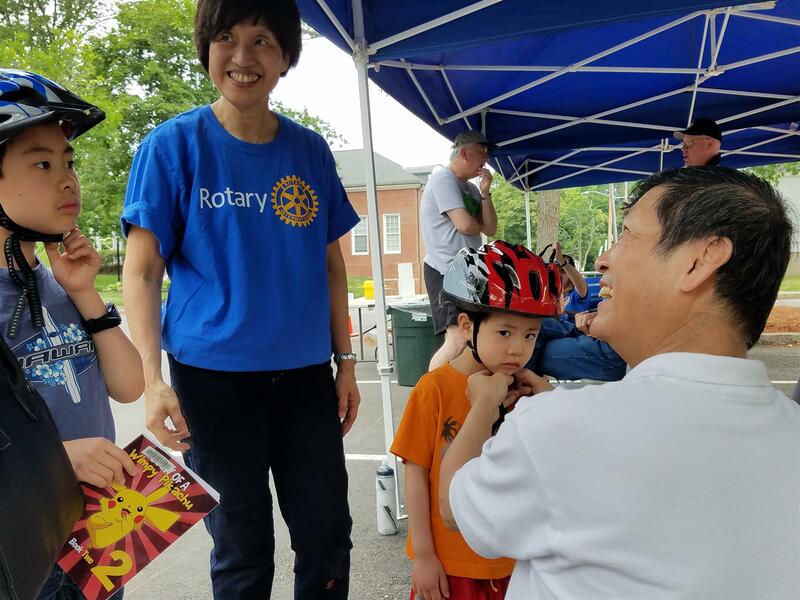 Annually the Rotary Club of Bedford conducts fundraising events specifically to maintain the Foundation's funds and ensure Bedford Rotary's ongoing project and service funding. We fund all sorts of projects. 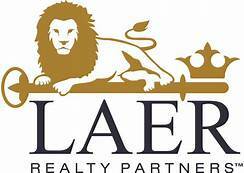 If you would like to request funds for your project, Click here. What Kinds of Projects Do We Fund? Based in neighboring Chelmsford (MA), Operation Delta Dog rescues homeless shelter dogs and trains them to become service dogs for local veterans who are suffering from TBI (Traumatic Brain Injury), PTSD and other challenges. It is the premier service dog organization focusing solely on veterans. Bedford Rotary contributed financially and participated in ODD's 2017 Veteran's Day Walk and Wag Day fundraiser. 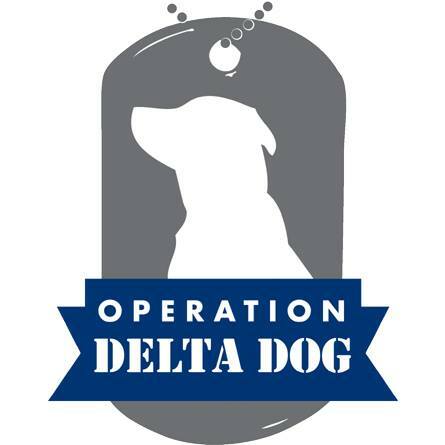 In 2018-2019 Operation Delta Dog support will be a principle target of Bedford Rotary's service and support efforts. The Bedford Memory Cafe, a partnership creation of Bedford's Council on Aging and Cooperative Elder Services, a local adult day care health provider, was inaugurated in January 2018. Funded in part by Bedford Rotary, the Memory Cafe welcomes individuals with dementia, and their caregivers, to experience a sense of community on the fourth Tuesday of each month. 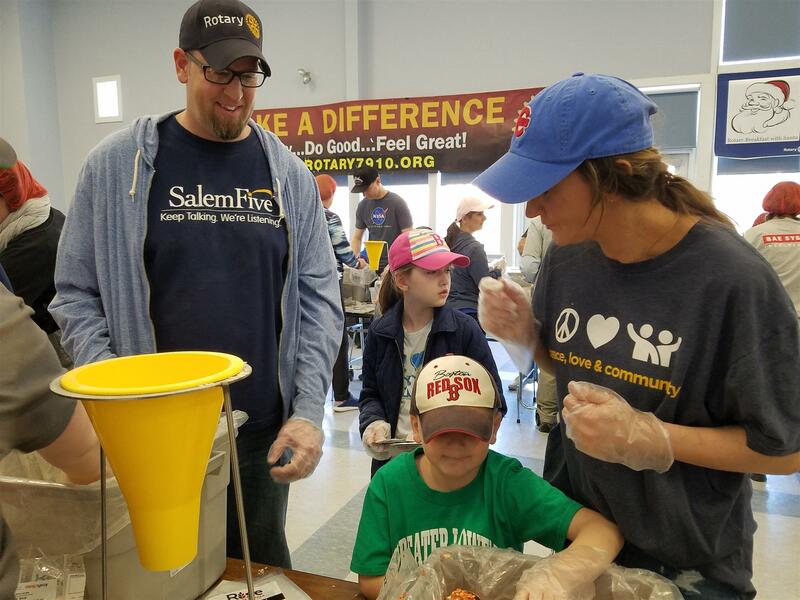 In it's sixth year, this annual meals packaging event saw nearly 300 volunteers package 62,000 meals for needy children and families in Burkina Faso, West Africa. Conducted in partnership with the international hunger relief organization, Rise Against Hunger, and funded in part by Bedford Rotary, along with targeted corporate and individual fundraising by the club, this event brought the six-year packaged meals total to more than 320,000. Co-hosted by the Bedford Police Department and the Rotary Club of Bedford, Bike Safety Day is an annual spring opportunity for town children to participate in a valuable safety learning experience and receive a free, custom-fitted bicycle helmet. The helmets are purchased and donated by Bedford Rotary and the fitting is performed by volunteer Rotarians. Bedford Police officers coach the kids through a specially configured obstacle course that tests their riding skills. Bedford Rotarian Paula Gilarde, only a month after joining Rotary, exemplified the spirit of service to mankind by joining on a relief mission to hurricane ravaged Puerto Rico organized by Rotary District 7910. Bedford is one of 53 Massachusetts communities within the district. Spurred by her reporting about the experience upon her return, Bedford Rotary enthusiastically endorsed funding support for the relief efforts. Bedford TV, award-winning community access television, lends frequent support to Bedford Rotary by sometimes having cameras and crew on-the-scene for a Rotary community event or reporting on the Club's activities during its weekly live newscast. The station's dedication and service to the Bedford community and its citizens has been recognized by Bedford Rotary through funding that has allowed Bedford TV to obtain the studio editing and field camera equipment needed to fulfill its community access mission. Check out the projects we have funded throughout the years, or apply for your own grant!